24/09/2014 – Today marks the 11th anniversary of the death of Edward Said, the Palestinian American literary theorist and public intellectual. He is best known for his book Orientalism (1978), where he analyzes the cultural representations of the East. Other works include “The Question of Palestine”, “Covering Islam”, and “Culture and Imperialism”. We have gathered words from some of Said’s friends and peers describing his character and sense of identity. 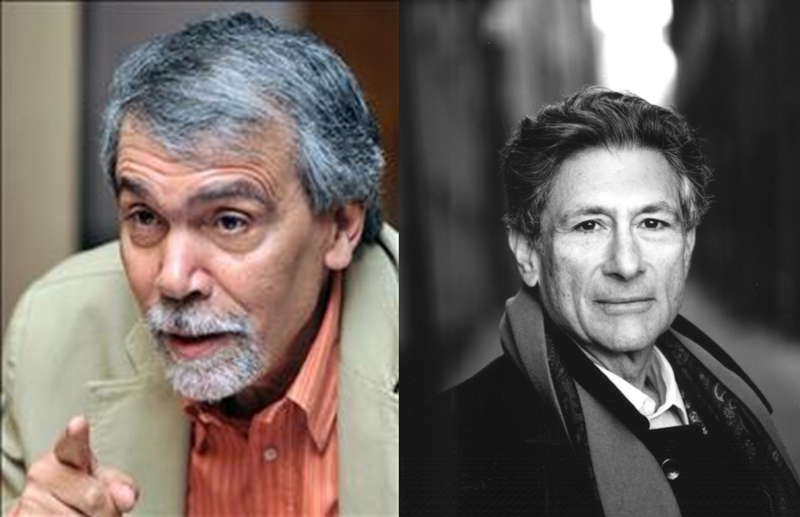 Chomsky speaks of Said’s intellectual prowess, Ahdaf Soueif describes his “fluid identity”, Tariq Ali and C. Hitchens discuss his “immaculate dress sense”, and Mahmoud Darwish recites the shared narrative of victims. Said was one of the most remarkable and influential intellectuals of the last half century. Much of his immense effort and talent was dedicated to overcoming the insularity, prejudice, self-righteousness, apologetics that are among the pathologies of power and defending the rights of the victims. Some years ago, while writing a short notice for Said’s Peace and Its Dis­ contents, I noted that from his “difficult situation as a Palestinian in the United States and an American in the Arab world he addresses East and West with even fairness and vigor. In the articles written for the western press he speaks of shoddy American deal-making, of Israel’s imperialism and racist policies. In the Arab press he writes of the compromises of the Palestinian leadership and the brutality of its security apparatus. To Arabs eager to ca­nonise him as an implacable foe of Israel he writes of the need to establish dialogue with dissident Israelis like Israel Shahak and Danny Rubenstein” (Times Literary Supplement, December 1996). Perhaps the role of the public intellectual is.the only one that will allow (perhaps necessitate) Said’s fluid identity, the only “place” where he can be not out of place. In the same way, his advocacy of the Palestinian cause is the closest he can come to regaining the homeland he never had. At the last two of his public events that I attended with him – one in Brighton, the other in Hay – people were coming up afterwards just to touch him. It was as though he was a talisman. He laughed it off: “You know me, I’m just an old demagogue,” he said. Edward Said was a longstanding friend and comrade. We first met in 1972, at a seminar in New York. Even in those turbulent times, one of the features that distinguished him from the rest of us was his immaculate dress sense: everything was meticulously chosen, down to the socks. It is almost impossible to visualize him any other way. At a conference in his honour in Beirut in 1997, Edward insisted on accompanying Elias Khoury and myself for a swim. As he walked out in his swimming trunks, I asked why the towel did not match. ‘When in Rome’, he replied, airily; but that evening, as he read an extract from the Arabic manuscript of his memoir Out of Place, his attire was faultless. It remained so till the end, throughout his long battle with leukaemia. One could commence by saying quite simply that if Edward’s personality had been the human and moral pattern or example, there would be no ‘Middle East’ problem to begin with. His lovely, intelligent and sensitive memoir, Out of Place, was a witness to the schools and neighborhoods, in Jerusalem and Cairo, where fraternity between Arabs, Jews, Druse, Armenians and others was a matter of course. He was always faultlessly dressed (as far as I could tell, anyway) and used to delight in buying clothes for his wonderful wife, Mariam. On one occasion in New York, after giving us a tremendous tour of the Metropolitan Museum during its show on the art of Andalusia (and filling out the most exquisite details on the syntheses and paradoxes of Islamic, Moorish and Jewish Spain), he took my own wife on a tour of the shops to advise her expertly on the best replacement for a mislaid purse. I never met a woman who did not admire him, and I never knew him to be anything but gallant. As I look back, I am inclined to be overcome at the number of such occasions, where his bearing and address were so exemplary and his companionship such a privilege.